Togepi's official artwork from Pokémon FireRed and LeafGreen. Togepi (トゲピー, Togepy) is a character from the Pokémon franchise. It appears as a Poké Ball Pokémon in Super Smash Bros. Melee, Super Smash Bros. Brawl, and Super Smash Bros. 4. 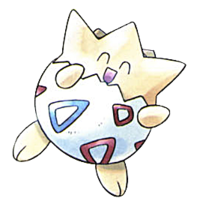 Togepi's official artwork from Pokémon Gold and Silver. 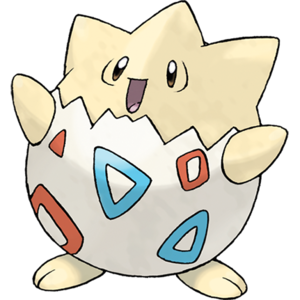 Togepi is a Fairy-type (Normal-type prior to Generation VI) Pokémon introduced in Generation II, and is categorized within the Pokédex at #175 as the "Spike Ball Pokémon". It evolves into Togetic when happy enough, gaining a secondary Flying type, and then, starting with Generation IV, into Togekiss using a Shiny Stone. It is very rarely found in the wild, and it's most often received as a gift when still an Egg. Metronome is a very peculiar move naturally available to very few Pokémon: when selected, it allows the user to perform a move chosen randomly among almost all the moves existing in the game. Togepi can learn it naturally at a very low level in every game. It uses Metronome as its attack. While Clefairy's Metronome attack deals out various damaging attacks, Togepi's Metronome deals out status effects to all characters within a certain radius. The summoner is not harmed by any of Togepi's Metronome attacks. Leech Seed: Inflicts the flower status on any fighters who are in Togepi's glowing attack radius. Other than the flower damage, the attack hits consecutively with no knockback, and deals about 22%, with the first hit dealing the most damage. Powder Snow: A blast of ice is shot out. Any character stuck in the blast radius will be frozen for a couple of seconds and take damage. Unlike other freezing attacks, Powder Snow is a meteor smash, and as a result has no noticeable knockback on grounded characters. Deals about 10% damage. Hypnosis: Togepi casts Hypnosis, but unlike Bellossom's attack, it's in a large radius and in a single burst. A character will fall asleep momentarily if he/she is in the attack's radius, taking about 10% damage. As with other attacks that induce sleep, it doesn't affect mid-air characters. Magnitude: Togepi starts shaking the ground. Anyone near Togepi will become buried for a couple of seconds, like the effect from Donkey Kong's Headbutt attack. This attack looks similar to Venusaur's attack. Hits a maximum of 3 times, each one doing 5% damage. Night Shade: Togepi releases a black magic aura, which completely blackens the screen for several full seconds, disorienting players, though computer-controlled characters are unaffected. Due to its undesirable nature, this attack is noticeably rarer than the other four. Togepi features as a collectible trophy, unlocked as one of the 100+ trophies that can be collected randomly during normal play, such as in the Trophy Lottery and throughout the various single-player regular matches, though it only appears once 200 VS matches have been played. 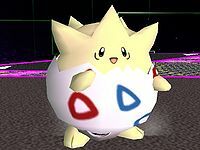 In Super Smash Bros. Brawl, Togepi returns, using a similar set of moves to what it used in Melee. However, it no longer uses Night Shade, but SmokeScreen, which has the same effect of blackening the screen. This is more logical, considering that Night Shade was a damaging attack in the Pokémon series, while SmokeScreen obscured vision. Togepi's old Sleep Powder is also replaced with Hypnosis, which scatters dark, blue waves around Togepi, rather than small spores. Otherwise, it has the same effect as Sleep Powder on the previous game. A Spike Ball Pokémon. It's said that its shell is filled with joy, and a proverb asserts that if you can get a sleeping Togepi to stand up, you will gain happiness. Togepi can lower its opponent's attack power using Charm. Once it has become friends with its Trainer, Togepi evolves into Togetic. Togepi returns as a Poké Ball Pokémon in Smash 4. It still uses Metronome and works like in Brawl. Togepi trophy in for Wii U.
Togepi trophy in for 3DS. This Fairy-type Pokémon grows by feeding off the happiness, fun, and kindness of others. It's always filled with joy! 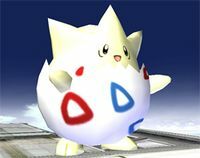 In Smash Bros., Togepi uses the unpredictable Metronome move on foes. This move can cause drowsiness, damaging-flower growth, or stage darkness. A Fairy-type Pokémon that's always sunny side up! It can siphon positive energy from people and spread it across the world. Its Metronome attack can have a wide variety of effects. Maybe it'll plunge the stage into darkness. Maybe it'll plant damage-dealing seeds on fighters' heads. Whatever it does, Togepi will leave fighters scrambling. Togepi yet again reappears in Ultimate as a Poké Ball Pokémon. It also appears as a Spirit. Togepi cannot be summoned on Arena Ferox, Brinstar, Corneria, Magicant, or Spirit Train. Official artwork of Togepi from Super Smash Bros. Ultimate. This page was last edited on April 20, 2019, at 02:19.